I read this article and found it very interesting, thought it might be something for you. The article is called Rural Jobs Collapse In 2016 Fuels Migration: Yashodabai’s Story and is located at https://archive.indiaspend.com/cover-story/rural-jobs-collapse-in-2016-fuels-migration-yashodabais-story-98694. Marathwada farmhand Yashodabai, 38, lives in a home of four bamboo sticks and two tarpaulin sheets in the central Mumbai suburb of Ghatkopar. There is no electricity or water. It is either too hot or too wet. When it rains,food—cooked and raw—clothes and medicines get wet. Still, she came to Mumbai during the summer heat, travelling 600 km from her drought-hit village in southeastern Maharashtra.Despite the privations of the city, she and her husband, Govind, can feed three of the six children with them and earn enough to, hopefully,repay a Rs 1.5-lakh loan from a moneylender. Farmhand Yashodabai Rathod, 38, migrated to Mumbai for the second time in last three years, with her husband, their three daughters and three sons, brother-in-law and wife and their three children, from the drought-hit southeastern Maharashtra region of Marathwada. Sporting a gold nose-ring and mangalsutra (a gold chain Hindu women wear as a sign of allegiance to husbands), Rathod shared her story reluctantly but with candour, playing with her 10-year-old son, as she discussed the chores for the day with sister-in-law Nageshree Vishnukant Rathod, who was babysitting her two-year-old daughter. Nageshree Vishnukant Rathod, 25, is married to Vishnukant, two to three years younger than her. Like 50 families in her village, Nageshree earned no money for 30 days of work—the fallout of a local scandal—under the Mahatma Gandhi National Rural Employment Guarantee Programme (MGNREGA), the world’s largest make-work programme, which is by law meant to provide 100 days of paid work every year. Yashodabhai sets off to find work only when the family is short of money. When she does work, she earns Rs 300 a day, mostly as a bigari or unskilled worker at construction sites. Her family’s 600-km migration by bus indicates the administrative failure of a government programme meant to provide work to the poor, especially in times of distress. Five of Rathod’s family broke boulders and built temporary roads, working 30 days under the world’s largest make-work plan, the Mahatma Gandhi National Rural Employment Guarantee Programme (MGNREGA), in her village of Nevli in Mukhed taluk in the southeastern district of Nanded last year. Yashodabai, 38, has three daughters and three sons. She had the eldest of her daughters married at age 14. One daughter dropped out in the eighth grade, and the youngest one is in fifth grade, about to meet the same fate as her sisters. None of them were paid, the fallout—as we will explain—of a scandal that indicates administrative lapses and the MGNREGA’s failure in a year of record drought, during which it should have been working at full tilt, guaranteeing 100 days of work to every household every year, as required by law. 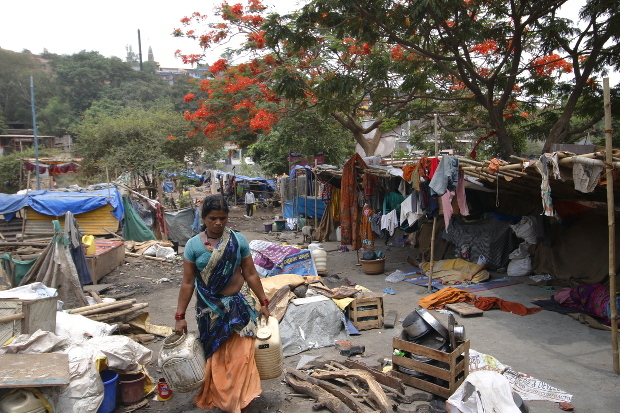 Instead, nearly four times as many families (350 instead of 80-100) left Mukhed and flocked to a temporary migrant site of tarpaulin-and-bamboo homes in the central Mumbai suburb of Ghatkopar. We examined some of these lives in the first part of this series as part of an IndiaSpend survey. Rathod’s family, with two other couples, own about two acres of land in their village. There is no irrigation, well or borewell, so they could plant no winter crop after the rains failed last year. They worked as farm labour during 2015’s four monsoon months, finding work three days every week. Women earned Rs 100 a day, the men Rs 200. For the four monsoon months, the family earned Rs 20,000, not enough to get by. 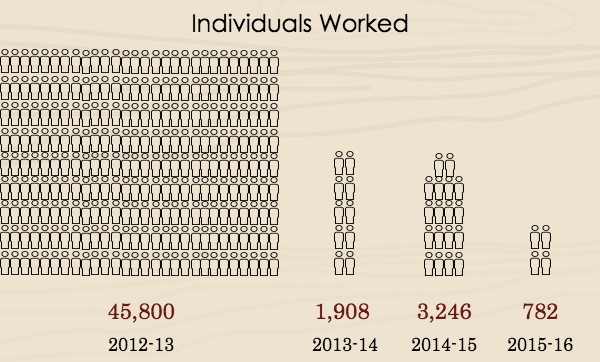 It is in situations of distress like these that the MGNREGA was meant to offer an alternative to migration. With the MGNREGA—about which the only thing she knew was that her work was getting registered on a job card—failing, her family, like many others, lost faith in the world’s largest make-work programme, which the World Bank in 2013 called a “stellar” example of rural development. 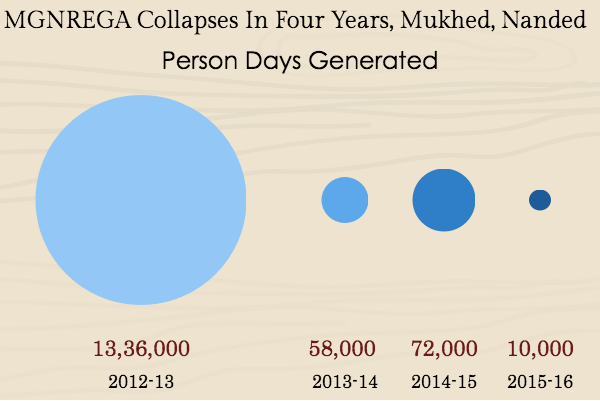 In Mukhed, the MGNREGA’s failure was a key reason for migration. “MGNREGA works were in full swing in the entire district till 2011-12,” Kalpana Kshirsagar, deputy chief executive officer of Nanded District Council, told IndiaSpend. She acknowledged that “activity has subsided in the last three years, especially in Mukhed taluk of Nanded district”, where Rathod’s village is located. 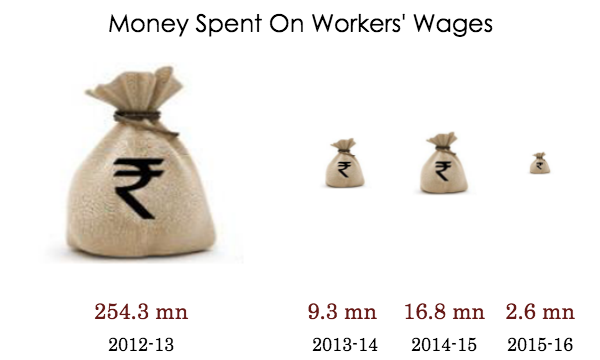 Expenditure on wages, number of person-days employed and those who worked in Mukhed taluka declined steadily between 2012-13 to 2015-16; a period that—according to local politicians—sent a flood of migrants to Mumbai. No more than Rs 26 lakh was spent as MGNREGA wages for 782 workers in 2015-16, compared to Rs 25 crore on 45,800 workers in 2012-13. Tushar Rathod, Bharatiya Janata Party member of legislative assembly (MLA) representing Mukhed taluka, said the data did not reflect reality. MLA Rathod spoke of “a panic situation” in the taluka, with no village panchayat “daring to initiate MGNREGA works, the key reason for the steep fall in jobs created and money spent on the scheme”. Kshirsagar, the bureaucrat, said that those who signed up for MNREGA also got more money working on large farms and still more working on urban construction sites. “So, they naturally avoid MGNREGA,”she said. 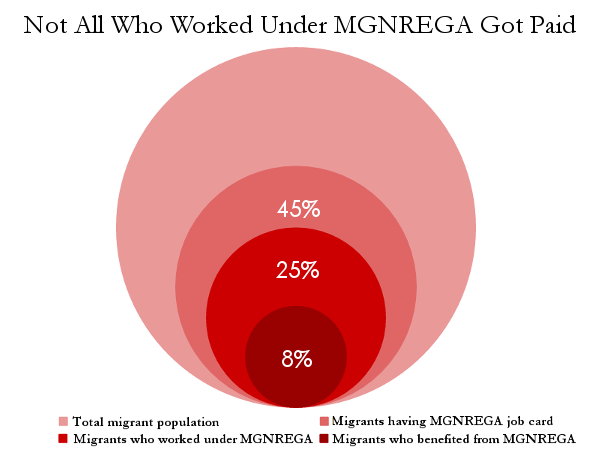 Yet, many would stay, had MGNREGA worked as it should, as Rathod confirmed. “Amchya gavaatach kaam bhetla tar hikda yaaychi paali naay yenar (If we get enough work and earn enough in our village itself, we won’t need to come here)”, said Yashodabai. The agent who supervised MGNREGA inYashodabai’s Nevli village, did not pay her family the money they earned, saying that he himself had not received money from the government. “Tyo mukadam police patlacha porga vhata. Deto Deto mhanla, an dilech nhait paise. Aami kaay karnar tyala? (The works supervisor was the son of the police patil, a village police officer. He repeatedly said he’d pay us our due, but never did he. His family controls a powerful administrative post in the village, there was nothing we could do),” she said. Series concluded. You can read the first two parts of this series here and here.